The parasitic larvae of several wasp species have been shown to wield an influence over their caterpillar hosts that has an unexpected plus-side for the caterpillar's cabbage food-plants. The 'cabbage white' caterpillars — the larvae of the Large White and the Small White butterflies — are not the only species attracted to the plant; the larvae of the Diamond-back Moth Plutella xylostella also have a taste for cabbage. Cabbage plants that have been nibbled at by cabbage white caterpillars are particularly attractive to female Diamond-back Moths in search of a plant on which to lay their eggs. However, if the cabbage white caterpillars already on the plant have been infected by the parasitic wasp larvae, the plants become less attractive to the the Diamond-back Moths. The level of impact depends on the species of parasitic wasp that is developing within the caterpillars. The wasp Hyposoter ebeninus lays its eggs in a Small White caterpillar (Tibor Bukovinszky). Plants that are gnawed at by caterpillars produce blends of volatile chemicals that attract parasitic wasps. These wasps lay eggs in the caterpillars; the eggs hatch inside the caterpillars and devour their hosts from the inside. Once mature, the parasitic wasps break free, killing the caterpillars in the process. With this, the wasps help to control numbers of the butterfly and reduce further egg-laying and development of more hungry cabbage-leaf-eating caterpillars on the cabbage plant. However, researchers found that, during their development, the parasitic wasp larvae influence the caterpillars and their effect on the plant in a more surprising way; and with far-reaching consequences for the Diamond-back Moth. Researchers monitored the activity of nine genes that are activated when the caterpillars of the Small and Large White caterpillars are actively feeding on the cabbage plant. 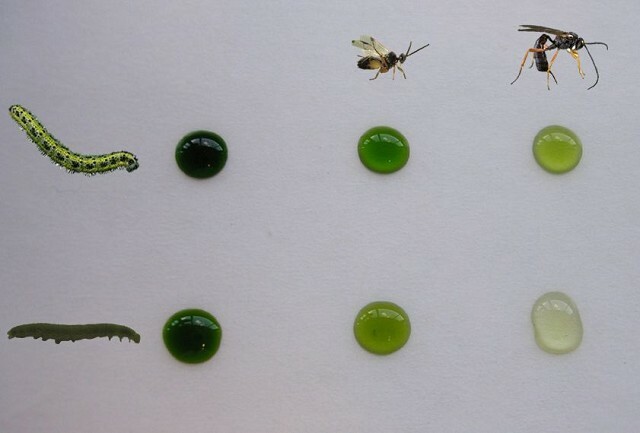 The researchers used caterpillars that were parasitised with one of three different species of parasitic wasp larvae. The plants appear to respond differently to the two species of caterpillars, but it was the species of parasitic wasp that was developing within the caterpillar that made the biggest difference to the response of the plant. It was found that the saliva of the caterpillars affects the plant's response; each individual species of parasitic wasp has a different effect on the quality of the caterpillars' saliva, which is reflected in the colour of the saliva. Saliva from caterpillars of the Large White (top row) and the Small White (bottom row). The caterpillars were uncolonised (left) or colonised by either Cotesia glom era (middle) or Hyposoter ebeninus (right). The colour of the saliva differs depending on the caterpillar and the species of parasitoid that attacks the caterpillar (Erik Poelman). The research carried out at the Universities of Wageningen and Rennes (Netherlands and France, respectively) shows that parasitic wasps that infest cabbage white caterpillars do not only kill the caterpillars but also, though the altered response of the plant to the caterpillars' saliva, render the cabbage plants less attractive to the Diamond-back Moth. Diamond-back Moths throughout the world have become resistant to many insecticides and there is an urgent need for alternative pesticides. In the UK, the Diamond-back Moth is well known for its migratory tendencies. Sometimes many thousands can appear during the night at coastal migration watchpoints. In the case of cabbage whites, biological pest control gives the cabbage plants extra protection against Diamond-back Moths. Researcher Erik Poelman calls this a spectacular discovery, and adds: "This could help us to develop an environmentally friendly way of protecting cabbage plants from Diamond-back Moths." Erik H. Poelman, Si-Jun Zheng, Zhao Zhang, Nanda M. Heemskerk, Anne-Marie Cortesero, Marcel Dicke (2011). Parasitoid-specific induction of plant responses to parasitized herbivores affects colonization by subsequent herbivores. Proceedings of the National Academy of Sciences. Written by: Poelman et al.